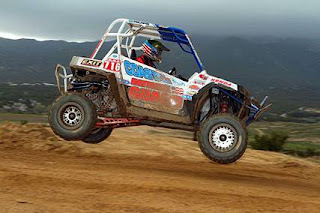 National Guard Polaris Coastal DragonFire Yokley Racing Team driver William Yokley finished 2nd in the Side by Side 1 Class in Round 4 of the 2011 WORCS Series. National Guard Coastal Yokley Racing ATV Team rider Jarrod McClure finished 5th in the Pro ATV Class. 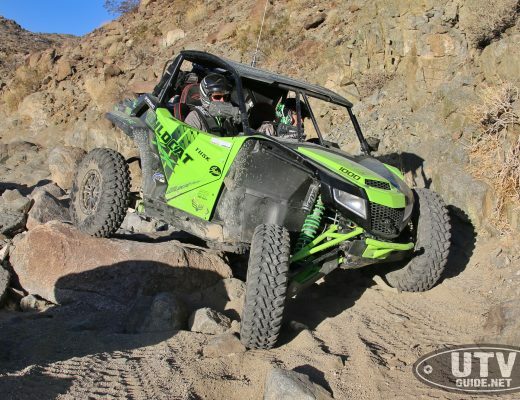 The National Guard Coastal Yokley Racing team arrived in California two days before this WORCS race to do some testing and get used to the terrain. Team Side by Side driver Scott Kiger unfortunately was not able to make the trip. He underwent an emergency appendectomy on Thursday, and is recovering back in West Virginia. The team did the finishing touches on the machines and headed to Cahuilla Creek MX Park in Anza. The course was very fast with a few technical sections including a Pro section featuring huge rocks that had to be ridden over. A pro-style motocross course was also utilized. William Yokley got a 5th place start in the 45 minute Side by Side Class 1 race. There were 15 in the class, and he passed 2 competitors in the motocross section on the opening lap. He caught up to leader Beau Baron and settled into a good pace. The track crew heavily watered sections of the course, so if you followed too closely, the mud roost was pretty heavy. Yokley made a charge on the 4th and final lap, but came up just short, and settled for 2nd place. Congratulations to Beau Baron for the victory. Polaris RZR XP’s swept the podium, so it was a great day for these new machines! Yokley maintains his WORCS series points lead, and now focuses on his next Side by Side race at the Indy 100 GNCC event in Gosport Indiana on May 14. The National Guard Coastal Yokley Racing ATV Team Rider Jarrod McClure is getting more comfortable competing in this series with every race. Actually, Jarrod is the only east coast racer competing full time in the WORCS series. Jarrod got a 6th place start at the beginning of the 90 minute Pro ATV race. The start area was concrete with a starting gate. Jarrod worked his way up to 5th position, and was challenging for 4th when he stalled his machine in the Pro rock section on the last lap. He did catch up, but finished in 5th for the day. Jarrod sits tied for 6th in the WORCS season points. His next race is the Loretta Lynn’s GNCC in Hurricane Mills TN on April 30.